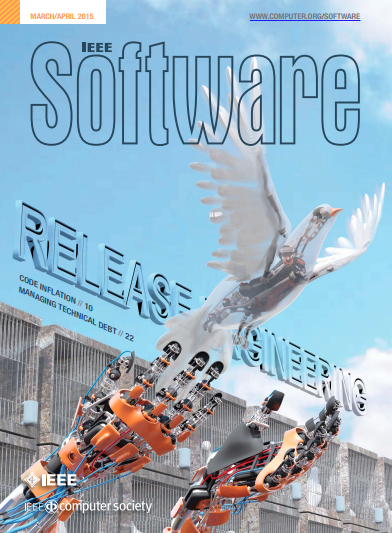 The release engineering special issue of IEEE software was published yesterday. (Download pdf here). This issue focuses on the current state of release engineering, from both an industry and research perspective. Lots of exciting work happening in this field! I’m interviewed in the roundtable article on the future of release engineering, along with Chuck Rossi of Facebook and Boris Debic of Google. Interesting discussions on the current state of release engineering at organizations that scale large number of builds and tests, and release frequently. As well, the challenges with mobile releases versus web deployments are discussed. And finally, a discussion of how to find good release engineers, and what the future may hold. Thanks to the other guest editors on this issue – Stephany Bellomo, Tamara Marshall-Klein, Bram Adams, Foutse Khomh and Christian Bird – for all their hard work that make this happen! As an aside, when I opened the issue, the image on the front cover made me laugh. It’s reminiscent of the cover on a mid-century science fiction anthology. I showed Mr. Releng and he said “Robot birds? That is EXACTLY how I pictured working in releng.” Maybe it’s meant to represent that we let software fly free. In any case, I must go back to tending the flock of robotic avian overlords. I was really keen to read this but found the text impossible to read in my browser (Chrome on OSX) – any idea if it's available in other formats ? I want to see your words of wisdom ! I could see it in both Firefox and Safari without issue. I just updated the blog post with a link to a pdf that is available on their web site.